We made a commitment a couple of years ago to stop buying wrapping paper just as another way to stop consuming, and we haven't looked back. We coasted while we used up what we had, augmented with the classic comics-as-wrapping option, and this year we're ready to start using reuseable gift wrapping. 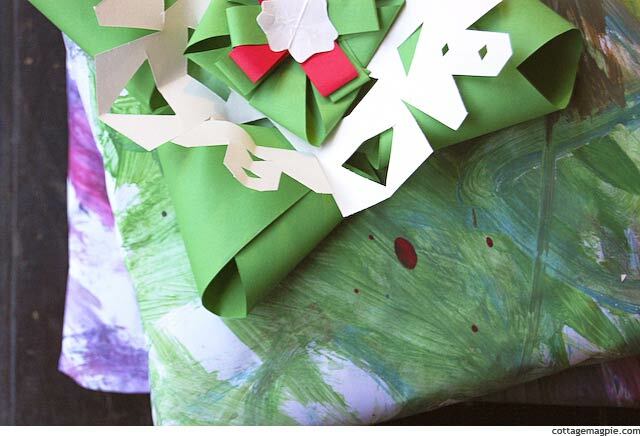 But... we didn't want to burden out-of-state family with cloth giftwrap that they would feel obligated to reuse, save or return, so we decided to stick with paper but go homemade! 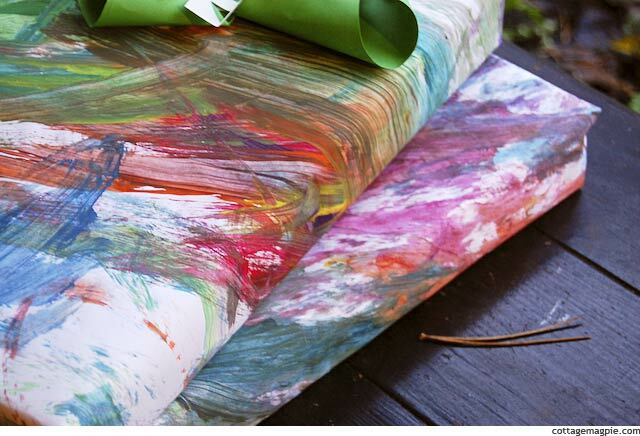 I just used a length off of one of those huge paper rolls and I had the kids have at it with tempera paint. I think next time I'll have them use markers or crayons, because the painted paper doesn't feel that nice in your hands when it's dry. If you can believe it, Mr. Magpie made the construction-paper bow with Baby Girl when they wrapped the present today. I was busy and asked if they could please, maybe, possibly add some kind of bow. I had no idea they would be so creative! It's lovely. So, what about you? 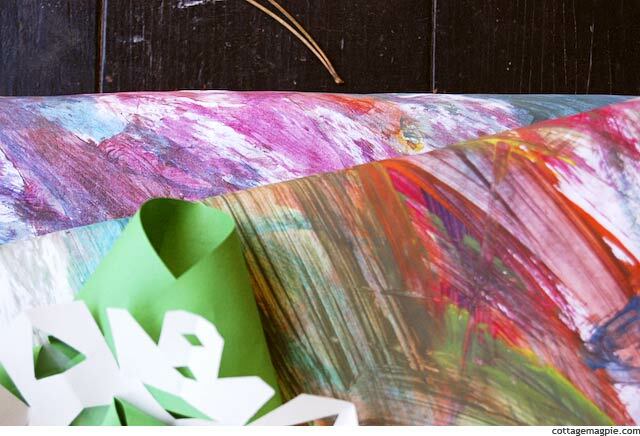 Have you ever considered reusable giftwrapping options? 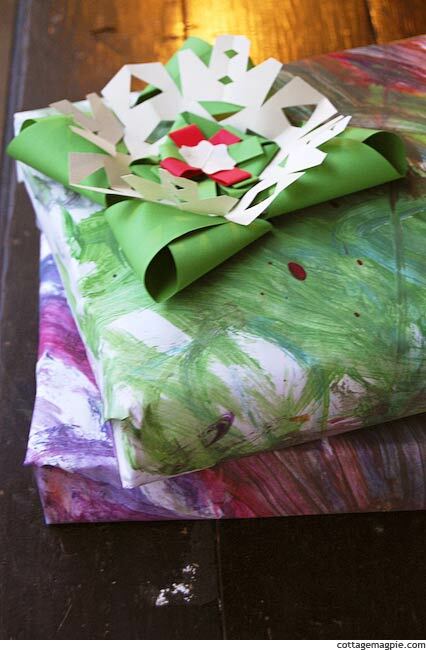 Do you let the kids help with giftwrapping? P.S. 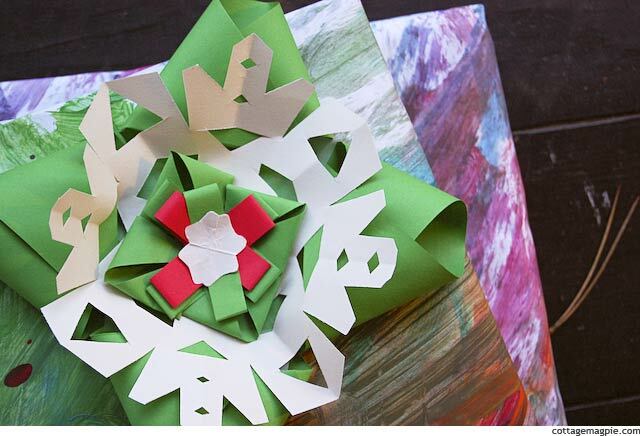 Don't forget to check out the snowflake making tutorial if you haven't already seen it! P.P.S. This post is part of my Christmas Parade series of Christmas blog posts for 2012. To see the entire post schedule and all the linky parties and other fun, check out the Christmas Parade Welcome post. P.P.P.S. If you haven't already linked up at the "Inspiration for the Season" Christmas Linky Parade party, you should do that! Either here or at Songbird. P.P.P.P.S. We've got a Pinterest board going that all five of the Linky Party ladies are adding to, and it's turning into quite a treasure-trove of eye candy. 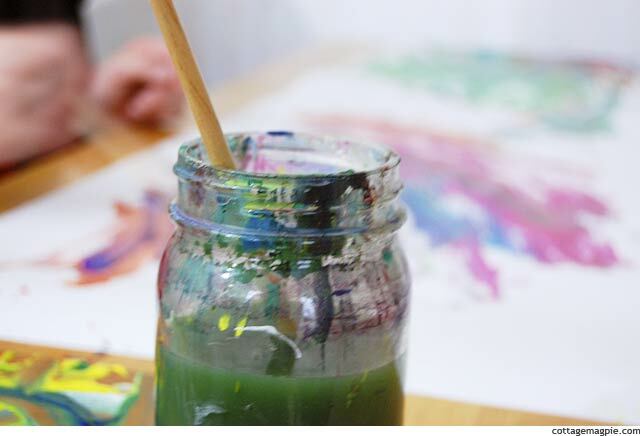 Go over to Pinterest to check it out.